MMMMM-What Do These Delicious Foods Have In Common? The Boost Your Immunity! Immune strength is highly related to food intake you know so here are a few of the best foods to help protect ourselves from illness. Green Tea-Where do I begin? I love green tea and can never seem to have enough of it-if I were a drink I would want to be green tea (okay maybe a diet Pepsi but that is not healthy so therefore exempt, right?). Green tea is a rich source of a type of antioxidant known as a catechin. The catechin in green tea called Epigallo Catechin Gallate (EGCG) has been shown to increase a specific type of immune cell. EGCG in green tea has been shown to slow the spread of flu virus in multiple studies. Another healthy component of green tea is L-theanine, which is thought to improve immune response, according to a study done at Harvard. Carrots-Who doesn’t love to crunch on delicious carrots? Carrots are a rich source of beta-carotene which is a powerful immune booster that actually strengthens defenses against both bacterial and viral infections. Studies show that the more beta-carotene consumed, the greater the increase in protective immune cells, including those natural killer cells. Mangoes, papaya, oranges, melons and green leafy vegetables are also great sources of beta-carotene. MMMMMMM-Mushrooms-White button mushrooms, which represent 90% of the mushrooms consumed in the U.S., enhances natural killer cells therefore promoting immunity. I love mushrooms sautéed as well as in a delicious salad-load up! Blackberries, Blueberries, Pom Juice-Some of the best superfoods out there chocked full of immune-boosting antioxidants. Antioxidants protect and repair cells damaged by free radicals, making you better able to ward off infections and flu. Make sure the Pomegranate juice you choose is not full of juice fillers and sugar and to eat your berries raw and fresh rather than cooked. Yogurt-When consumed, probiotics, the good live bacteria in yogurt and other bacteria fortified products, go to the digestive tract-the place where 70%-80% of our immune cells reside. When germs enter through the mouth they will be warded off when the good and healthful bacteria are encountered. On this note I would also like to say a plain organic yogurt (not loaded with sugar) topped with delicious berries is one of my favorite and highly recommended treats. See how easy this is!! Hopefully you will have less flu’s and colds after incorporating these delicious and nutritious foods!!! Allergies, Allergies Go Away! Here Are Some Natural Remedies To Help Today! Sniff, sneeze, sniffle-yes, I am talking about those allergies that make your life miserable. According to the National Health and Nutrition Examination survey,more than 20% of the U.S. population suffers from some form of allergy (I personally get the hideous teary, puffy eye look when mine hit). Seasonal allergy symptoms are a natural reaction , the result of an overreaction by the immune system. If you are looking for relief from seasonal allergies, natural remedies are a great place to start. They are generally less harsh on the system than conventional drugs and they do more than just cover up your symptoms. Nutritional strategies, Herbs and homeopathic remedies are all wonderful ways to get your allergies on the right track..
NUTRITIONAL STRATEGIES **Research shows that there is a DEFINITE LINK BETWEEN ALLERGIES AND DIET. When we become deficient in certain nutrients and binge on highly processed ingredients and sugar our allergy symptoms can worsen. Frequent use of antibiotics can also have a negative effect on allergies. **PROBIOTICS-Like L. acidophilus and Bifidobacterium can help with some symptoms. Probiotic supplements provide billions of live organisms per capsule and they are beneficial forms of bacteria that support healthy immune function. They can also be found in yogurt, fermented foods and some probiotic fortified foods. I take a whole food supplement that has prebiotics and probiotics so I don't have to worry about finding it anywhere else. **VITAMIN C-regulates the release of histamine. Can be found in citrus fruits, peppers, watermelon and dark leafy greens. **VITAMIN E-is associated with lessening the risk of hay fever. Wheat germ, whole grains, nuts, seeds,eggs and dark leafy vegetables are a few sources. **BUTTERBUR-has been shown to support healthy membranes, and some studies have shown it to be helpful in decreasing the body's production of histamines and leukotrienes. Research indicates it works as well as many common conventional choices. **EYEBRIGHT-Used for eye infections and respiratory conditions. Helps soothe flamed membranes. **ECHINACEA, GARLIC, CHAMOMILE, YARROW, AND LICORICE ROOT-These all support the respiratory and immune systems , and help sinus function. 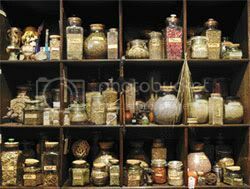 HOMEOPATHIC REMEDIES Homeopathic medicines come in many forms, including nasal and throat sprays,eyedrops and tablets that dissolve. For a variety of allergy symptoms, homeopathic formulas with a combination of ingredients often work best. They are clinically tested and work by exposing the body to a highly diluted dose of an allergen which helps the immune system. **NASAL CONGESTION-Recommended homeopathic remedy is Sabadilla. **WATERY EYES, SNEEZING, RUNNY NOSE- Recommended homeopathic remedy is Galphimia glauca. **SINUS CONGESTION AND PRESSURE, DRYNESS-Recommended homeopathic remedy is Kali bichromium. **RUNNY NOSE, SNEEZING AND SORE THROAT-Recommended homeopathic remedy is Sabadilla. **LARGE VARIETY OF SYMPTOMS-Recommended homeopathic remedy is Histaminum hydrochloricum. Now, to be honest with you (keep in mind I am a wanna be health nut and not a full fledged health nut-YET) I would have thought that I would have had no idea what to do or where to get any of these remedies because the names are so foreign to me. However, I went to my local health market and it was not difficult at all to find these items. If I can do it with two wild children running around screaming and me barely able to focus all you wanna be health nuts can too. As for you full fledged health nuts I am sure you probably have got it down. I really embrace trying natural remedies as they are easier on your system and have less side effects. P.S. To all my wonderful entrecard droppers, readers and commentors just want to let you know that I may be scarce the next few days so if I am not responding and dropping just know that I will make up for it as soon as I can. Have I mentioned how great it is to have you wonderful blog friends and readers!!!! Thank all of you for your comments during my frazzled moments of Interntet Explorer Blog drama. This is a quick follow up post to let you know how this was fixed. If you are having problems with getting into your blog via Internet Explorer as many of you mentioned then I would check your followers/friends that you have on your sidebar. This is how mine was fixed by simply removing that html from my site. My blog friend Beaded Tail was having the same problem and she resolved hers the same way. I hope this helps anyone needing it as I almost had 3 yes 3 diet pepsi's in a row and considered a little vodka (no vodka however) before it was all said and done. So I guess this could be a solution to helping your mental health before you do as I did and ran around all ablaze with blog drama for hours and acted like the world was ending. More health posts to come!!! BTW-Happy Memorial Day and be safe and healthy!! No, No, Noooooooo! Healthnutwannabeemom.blogspot.com Has Been Taken Hostage-HELP! We all know that I am more than confused by anything technological in this world. I like how things work but when something goes amiss I am in BIG trouble. I received a few emails from people trying to comment saying they were getting the below message and could not view my site on internet explorer (works fine on firefox). I cannot view my site either and truth be told it is driving me crazy. I decided that I was going to attempt to fix this on my own (come on Heidi!) well I googled all kinds of suggestions and many were good and logical (logical to aliens) except they may have been written in some lost languages ancient text for all the sense they made to me. Frustrated I ran and got a diet pepsi and blackberries-bad, bad, bad on the diet pepsi but good on the blackberries to balance out the bad diet pepsi (I doubt this is how it works but I could have grabbed a diet pepsi and chocolate bar instead so I get some points-remember I am still a wannabee health nut). The diet pepsi consoled me and I decided to write this post to let everyone know that I am in blog problem He@#$&*@#lllll!!! My hat goes off to all you technical geniuses because I am about to lie on the floor and kick, scream and cry because as we all know that is how to get things fixed-not. Anyway, I will get this fixed and soon up and running. Can you even read this? Had not thought of that. THANK YOU JOSH FOR FIXING THIS! IT IS NOW FIXED!!! In my lifelong quest to find foods that are healthy and slimming I have just encountered the most wonderful news! If you love Indian food as I do you will be even happier because according to a study from Tufts University in Boston turmeric (aka the skinny spice and often known in curry meals especially Indian foods) contains a plant-based chemical called curcumin which is easily absorbed by the body and appears to fight fat. The researchers findings which are in the Journal of Nutrition, also explains how curcumin suppresses the growth of fat tissue in mice and human cell cultures ( I am not for the testing of curry on mice or animal testing-sorry had to throw my opinion in there). Apparently the turmeric is effective when added to a high-fat meal, suggesting it could help fight obesity. It appears the curcumin prevents the formation of new blood vessels which in turn help expand fatty tissue which is the cause of weight gain. Now this is a great scientific explanation but the truth is that (I never did well in science-sigh) to me if it tastes good, is good for you and helps fight weight gain then wooohoooooo! Bring on the curry! It seems that the laboratory tests were done on mice who were fed high fat diets for 12 weeks (again I completely disagree with animal testing even if it is just curry). One group had 500mg of curcumin added to each meal and the other group did not. After 12 weeks, the mice which were fed curcumin weighed less than those which did not eat it. The researchers found the curcumin fed mice were not growing as many new blood vessels as the others and had lower blood cholesterol. The conclusion of the study data was that curcumin appears to suppress angiogenic activity in the fat tissue of mice fed high fat diets. For you science lovers you probably love the detailed scientific explanation but for you food and non scientific laymen (like me) you love that you can eat curry, curry, curry and fight fat. Now I just need to go and find some great recipes and spice them up with turmeric. I bet turmeric would be good in soups, rices, tofu, sprinkled on some nuts, etc. The options are endless so curry it up! Hurry for some curry! Sugar For Those Sweet Memories-Come on over sugar! As I have gotten older I have noticed that sometimes I tend to be more forgetful than I have been in the past. I have always attributed it to a combination of things such as being busy, age and just my general personality. Now there is some good news as one of my favorite things in the world-sugar- has been shown in recent studies to improve memory in elderly people . Now as much as I love sugar I also know that it must be eaten in moderation or can wreak havoc on our bodies so as good as this is just remember not to go out and eat and eat lots of sugary cakes and candies. According to my book Nature’s Prescriptions, a recent study showed the effects of sugar on elderly people’s memory. The test was done early in the morning before anyone had eaten breakfast. One group drank a glass of lemonade and the other group drank a glass of lemonade with saccharin. Researchers found that the group who had drank the sugary drink performed better on memory tests a short time later. In a related study, people who ate sugar just after reading something remembered it better a day later than those taking saccharin. Researchers aren’t sure how sugar works in the the brain to enhance memory but just know that it does. I cannot stress the importance of eating sugar in moderation as sugar is a big culprit in raising insulin levels which then tells our body to store fat. Don’t forget that sugar can be found in even the most unsuspecting of places like ketchup, spaghetti sauce, bread and even noodles amongst others. Reading labels and watching how much and where you get your sugar from can keep you healthy and bringing back those sweet memories!! Gourmet Superfoods That Kick Those Regular Superfoods Booty!!!! As more and more evidence emerges that what we eat is one of the most important things we do to ourselves to determine everything from aging to disease prevention, below are some superfoods that you may not be getting enough of but you wish you were. French Lentils- Hmmmmm-never knew there was such a thing however these are high in fiber (one third your U.S. RDA in a single half-cup serving). Lentils are a wonderful way to prevent diabetes, regulate blood sugar and are a great meat substitute (wonderful if you are a vegetarian like me). French lentils (green colored) are more delicate and peppery than the usual supermarket. Walnuts-Love walnuts, love, love, love walnuts and hope you do to because a single ounce contains more than the U.S. recommended daily amount of omega-3’s. Most nuts are also great sources of cardio-protective monounsaturated fats and hypertension-fighting L-arginine. A study published in the British Medical Journal linked eating them regularly to a 35 percent reduced risk of coronary heart disease. Gooseberries-Tart tasting but high in cancer-fighting vitamin C, vitamin A, calcium and iron. They kick the delicious and infamous blueberries booty by containing 50 percent more anti-oxidants. Avocado-High in fiber they contain 11 to 17 grams in just one fruit. A 2005 study in the Journal of Nutritional Biochemistry reported that avocados contain enough lutein to stop cancer growth in a lab experiment. Lutein also contributes to eye health. Guava-Has to be one of my all time favorites and is totally edible from skin to seeds if ripe. Sometimes known as the apple of the tropics is chocked full of antioxidants and potassium, which helps keep blood pressure in check. Greek Yogurt-Maybe I am uncultured but I have never heard of this but will definitely be looking into it. This strained creamy Greek yogurt has a significantly higher amount of protein than your average yogurt, along with high levels of calcium. A study in the International Journal of Obesity found that dieters eating three servings of fat-free yogurt a day lost 22 percent more weight and 61 percent more body fat than other dieters. Cremini Mushrooms-These are known for their rich flavor and a 2006 German study found that Cremini mushrooms have several microbial properties that could protect your body from disease and infection. Sunchokes-Taste like artichokes but are more closely related to potatoes. They do not have as much blood sugar boosting starch and and are loaded with vitamins A and B, potassium, iron, calcium and magnesium. Granted these are not your typical foods that you will easily find at the supermarket but check the gourmet food sections, specialty shops and amazon.com gourmet food area. They are healthy and might add a fun variety to your normal eating routine. MMMMMMMM! Enjoy! I have always considered caffeine to be one of my weaknesses. First thing in the morning I grab a cup of hot green tea and then another and another and another until I feel like I can finally get moving. I keep telling myself that I should buy the decaffeinated kind but honestly I love how it perks me up and now I have even more reason to not feel so guilty about my love of caffeine. I recently stumbled across this article here about how caffeine may prevent skin cancer and found this really interesting. Chocolate has caffeine, right? I must be in heaven! "Caffeine is starting to get attention because it may prevent skin cancer as discussed in the February issue of the Journal of Investigative Dermatology. Consumption of caffeine has been shown to be associated with lower incidences of nonmelanoma skin cancers in several epidemiological studies (Jacobsen et al., 1986; Hakim et al., 2000; Abel et al., 2007; Rees et al., 2007). One study of over 93,000 women showed that drinking coffee decreased their risk of skin cancer. Other research suggests that both oral and topical caffeine may offer powerful anticarcinogenic benefits." I must say that as always moderation is the key here so while caffeine does have its benefits everything has to be balanced. Happy Mothers Day To All The Mothers, and Grandmothers ! Want To Kick The Smoking Habit? These Foods Can Help Make Or Break Ya! Today, I was taking a bit of time as usual to become more informed on my health and wellness and came across this article about foods that help you quit smoking. I have personally never smoked as I had an embarrassing introduction to cigarettes in tenth grade at the local Pizza Hut in front of a guy I liked and that was it for me. Spitting water on the object of your affection while coughing to death from the cigarette smoke at the same time is enough to turn one off (both of us apparently). Never again. If you have tried patches or anti-smoking medications, but still can’t stop smoking, maybe it is time to experiment with specific foods to help quit smoking. Yes, there are foods proven to help when you’re trying to stop smoking. However, there are also foods like coffee, alcohol and meat that make cigarettes taste better. So you should also avoid these foods because they can serve as a trigger to smoke again once you quit. Foods that make cigarettes taste worse include dairy products, water, juice, fruits, and vegetables. The good thing is that these foods are all considered healthy and low in calories. You should also include exercise as it can help smokers ward off cravings for cigarettes.